We thank you most sincerely for keeping our work alive, for your kindness and compassion for the incredibly remote, and mostly impoverished, good people of road-less western Alaska. Your gifts and your prayers are our mission’s greatest strength, and we pray in thanksgiving for you every day. BRRR! 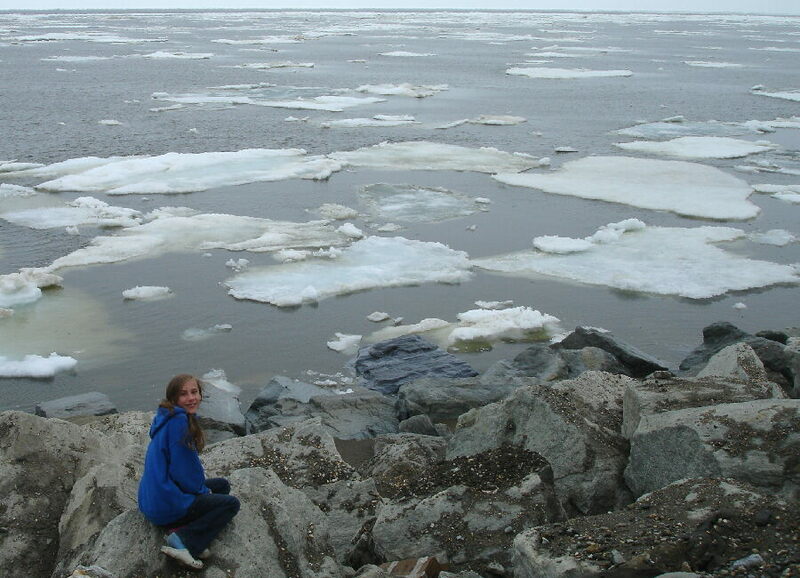 (left) In June, from the safety of Nome’s sea wall, 12-year-old Rosa Schmidt watches floating ice in the Bering Sea. Rosa, who helps out at the mission, is daughter of general manager Ric and business manager Lynette Schmidt. DO WE SEE SPOTS? Not really, but our listeners do hear them, both inspirational and educational, more than 68,000 times a year. Educational spots this past month spoke of scholarships, Arctic birds and animals (musk oxen, wolves and beavers), flood safety, Lupus, diabetes, high blood pressure, drunk driving prevention, thrift, regional history, foster homes, seat belt use, thrift, botulism, child abuse, botulism and smoking, among many, many others. WELCOME, FATHER ROSS!!! If you’ve been with us for a while, you will affectionately remember Ross Tozzi, who was a KNOM volunteer from 1989 to 1991. (Left) Seminarian Ross Tozzi visits KNOM to help with accounting, summer 1998. 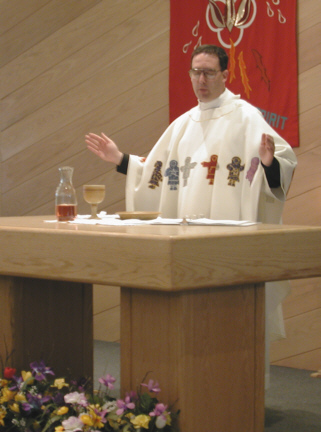 In 2001, he was ordained a priest in Nome on the very day of KNOM’s 30th anniversary. Our broadcast of that Mass was a centerpiece for our celebration that year. (Left) July 15, 2001, the day after his ordination, Father Ross offers his first Holy Sacrifice of the Mass, also live over KNOM. On July 1, Father Ross was assigned pastor for Nome’s Saint Joseph Parish, which has been priest-less for a while. You can imagine the immense joy with which we welcome him! The oldest Catholic radio station in the United States, a dynamic, positive friend throughout 100,000 square miles, thanks to you. INSPIRATIONAL SPOT: Every child is a unique and unrepeatable gift of God. INSPIRATIONAL SPOT: I could more easily contain Niagara Falls in a teacup than I can comprehend the wild, uncontainable Love of God. 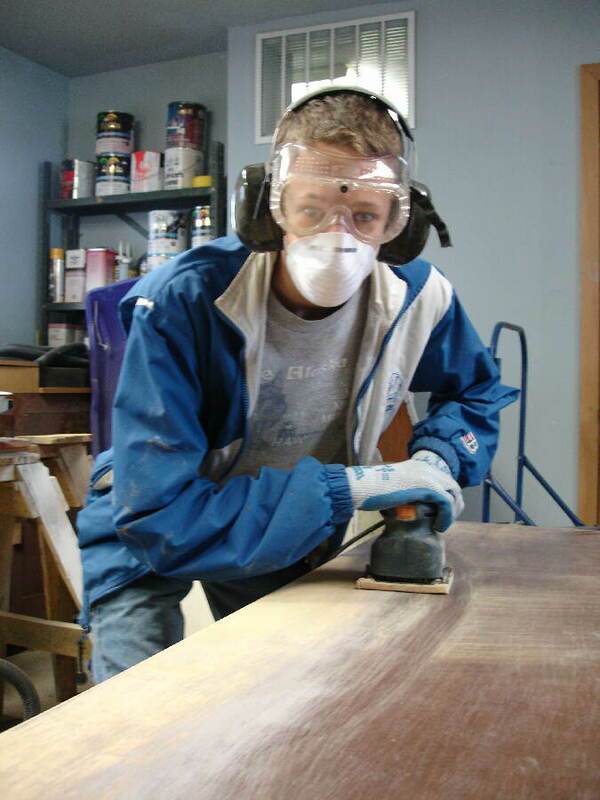 BENEATH THE SURFACE: (left) 14-year-old Tim Schmidt refinishes his mom’s KNOM business manager desk. You'll note from the photo that mom insisted Tim wear all appropriate gear, including ear protection. The desk is probably not an antique, though it’s been with the KNOM mission since the very beginning. It’s worth very little, but it has sentimental value. The first 263 “Nome Statics” were typed on it. Our guess is that it was brought to Nome by the U.S. Army, which established more than 700 buildings here during World War II. HARD TACK AND MORE: These large, round, inexpensive crackers remain edible practically forever, and since gold rush days have been a rural Alaskan staple. Recently, KNOM public affairs director Laureli Kinneen produced a creative show on the subject. She interviewed folks from the Sailor Boy Pilot Bread bakery of Richmond, Virginia, for whom Alaskans comprise 98% of their sales. She spoke with more than twenty local people on how they utilize it, and found one man who had written a poem on the subject, titled “Eskimo Manna.” “It was really fun,” Laureli says. Other recent shows centered on topics like Extreme Math, a program that helps students learn how mathematics is used in everyday work places, and how art and theater are taught in schools. One particularly emotional program featured a 17-year-old girl who suffers severe disfiguring birth defects and is bound to a wheelchair. She told KNOM listeners that she believes she was created this way in order to become an advocate for the disabled and the handicapped. Thank you for making these interesting, important, and sometimes difficult-to-listen-to programs possible. SUNDAY MASS: If you’re a Catholic in western Alaska, the overwhelming odds are that if you are to worship with a Sunday Mass, it will be via the KNOM broadcast. This region, the size of California, is served by only 7 priests, and in almost every village, Mass is offered only once every three to six weeks. Some have Mass once per year. 15 villages never see a priest. But one thing’s for sure. Everyone can rely on the KNOM signal. Thank you for helping! INSPIRATIONAL SPOT: Saints are sinners who just keep on trying. KNOM’S NEWEST: (left) Meet volunteer Linda Maack, who arrived in June from Baltimore, Maryland. A graduate of Lenoir-Rhyne College in North Carolina, Linda has been interested in radio broadcasting for years. All of her experience has been on the business side, and she’s eager to learn programming and broadcast engineering, too. She’s a friend of former KNOM volunteer Kristina Proctor, who encouraged her to apply. The daughter of a military family, she says that Nome is her 9th home in her brief 22 years! 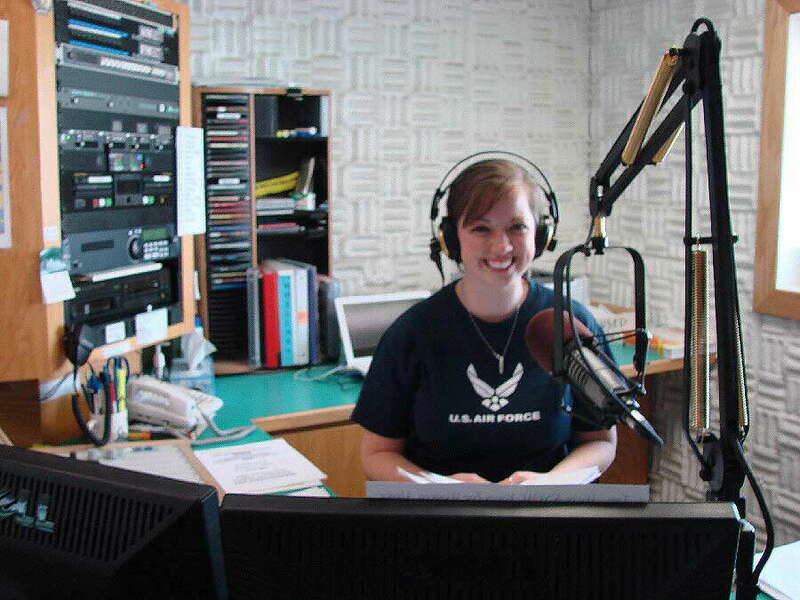 The photo was taken during Linda’s very first shift on the air, five days after arriving in Nome. We know that you join us in warmly welcoming her to the KNOM family. 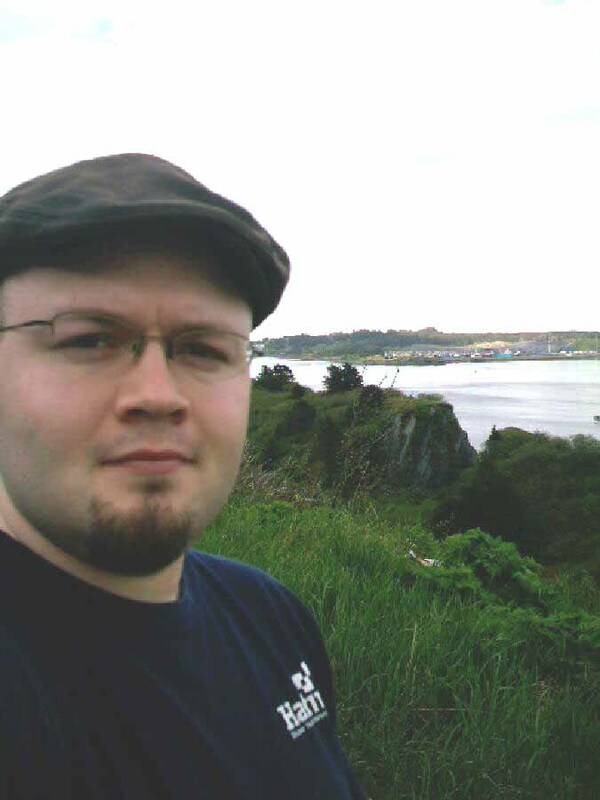 “LOCAL” NEWS brought KNOM volunteer reporter John Francis 634 miles south to the town of Kodiak, covering a conference sponsored by the State of Alaska to discuss ways to help rural Alaskans who suffer from substance abuse, or who have been sexually molested. The two problems, endemic to western Alaska, are fronts on which KNOM has been fighting on behalf of its listeners for nearly four decades. (Left) For John, the gathering in Kodiak was serious business. MEMORIAL DAY: Ever since we developed the capability of hand-carried remote broadcasting more than thirty years ago, KNOM has provided live coverage of Nome’s solemn Memorial Day procession from downtown to the cemetery, where prayers and blessings are offered. Last month, we received a card from the president of the town’s VFW Auxiliary, Peggy Darling. In turn, we thank you for making this service, and the many others we offer, possible. Thank you! INSPIRATIONAL SPOT: It's not a bad idea to plan ahead in our spiritual future, just as we do materially. Remember, it hadn't started raining when Noah built the ark! 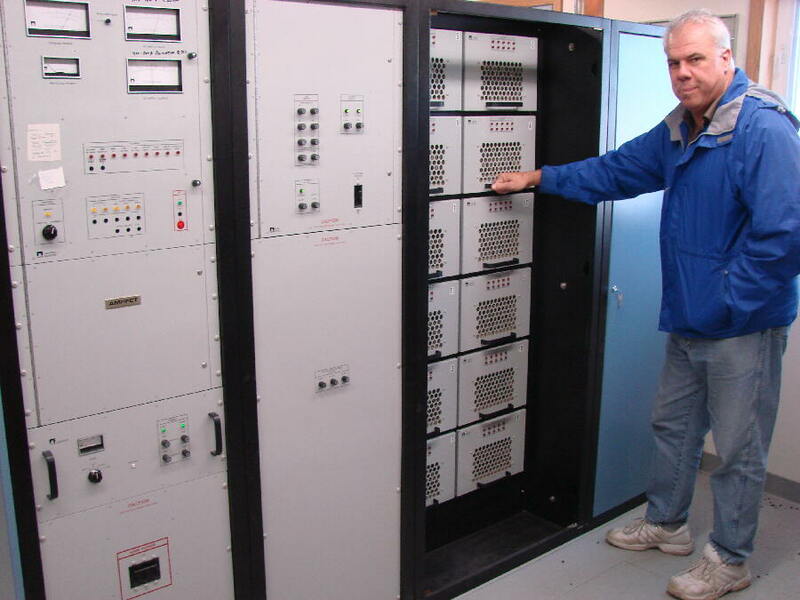 MORE POWER TO YOU: (left) General manager Ric Schmidt keeps watch on the mission’s 25,000 Watt transmitter. At left are the controls, in the middle the power supplies, behind him the final output cabinet, and in front of him, twelve modules, each of which produces about 2,100 Watts. These modules weigh about 40 pounds apiece. This month, former manager/engineer Tom Busch will be in Nome to remove all of them, one by one, to check for wear and damage, as part of annual preventive maintenance. Typically, this involves replacing several parts before they fail. 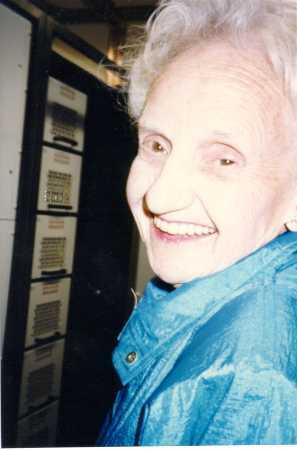 (Left) The late Antoinette Lauer smiles after cutting the ceremonial ribbon by KNOM's new transmitter, August 1997. FORTY YEARS AGO: In July 1969, the FCC announces its intention to lift the moratorium on new AM band allocations in the case of the proposed Nome Catholic station, but the Department of Interior’s Alaska land freeze continues to block use of a possible transmitter site. The FCC will not grant a construction permit until the rights to the land are secured. TWENTY YEARS AGO: Walking on the main street of Provideniya, USSR, on July 4, 1989, KNOM general manager Tom Busch encounters a Russian woman who recognizes his voice. Tom and son Steve are part of a Cub Scout field trip to the Soviet Union, the first visit by ordinary American citizens to the militarized region of Russia’s northeast Arctic coast. The event is later recounted in the children’s book “Friendship Across Arctic Waters” by Claire Rudolph. 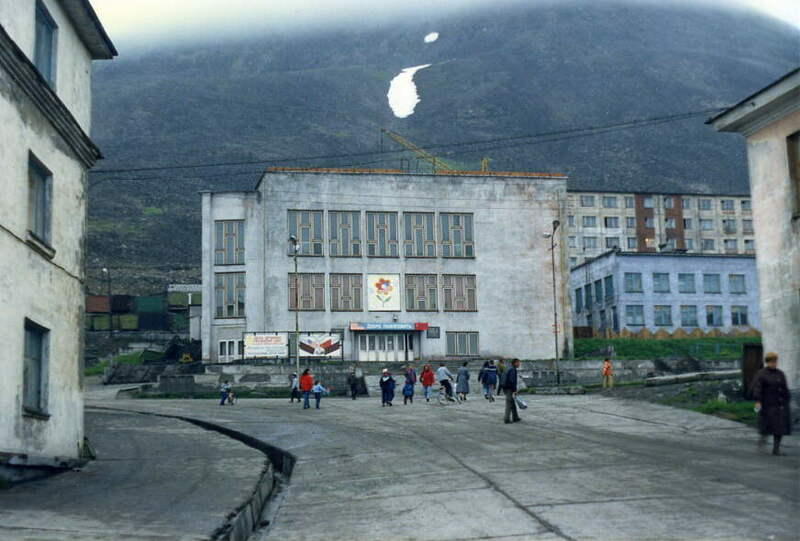 (Left) the main square in Provideniya, USSR is a bleak place in July 1989. TEN YEARS AGO: July 21st and 22nd, 1999, the mission’s tower contractor, Rod Ewing, applies a new coat of paint to the AM tower. Actually, it’s tedious work, using cotton mittens, taking about two minutes per foot of tower. 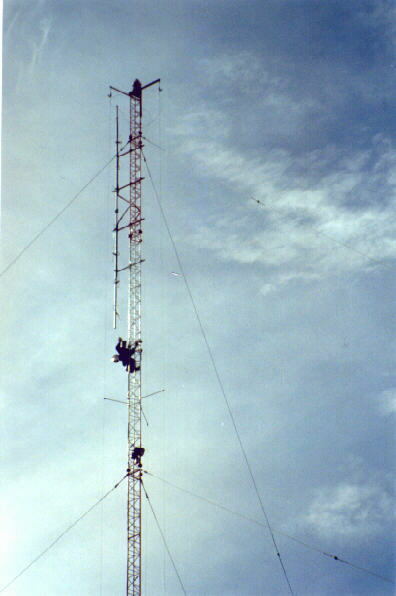 (Left) on July 21, 1999, Rod is painting the tower, working his way from top to bottom. WE HONOR YOU, WE THANK YOU. Once more, thank you so very much for keeping this valuable and popular mission station beaming strong. God bless you for your kindness!